Nationality: Belgian. Born: Jacques Frédérix in Ixelles, Belgium, 21 July 1885, became French citizen, 1928. Education: the Ecole régimentaire, Nivelles, 1905. Military Service: Served in Belgian Army, 1917–19. Family: Married Françoise Rosay, 1917, three sons. Career: Worked in family's cannon foundry, 1906–07; theatre actor in Paris, 1911–13, and in Lyons, 1913–14; also film actor, from 1912; assistant to film director Gaston Ravel, 1914; directed first film, for Gaumont, 1916; Les Nouveaux Messieurs banned in France for insulting "the dignity of parliament and its ministers," accepted MGM offer and moved to Hollywood, 1928; MGM contract terminated, 1933; moved to Switzerland, 1942; producer in Paris, 1945. Awards: Best Foreign Film Award, New York Film Critics, and Best Direction, Venice Festival, for La Kermesse héroïque , 1935. Died: In Prangins, Switzerland, 25 May 1948. Le Cinéma, notre métier , with Françoise Rosay, Geneva, 1946. "Impressions de Hollywood, L'Ordre," in Anthologie du Cinéma , edited by Marcel Lapierre, Paris, 1946. "Transposition visuelle," in Intelligence du cinématographe , edited by Marcel l'Herbier, Paris, 1946. "Je crois au film parlant, Pour vous," in L'Art du cinéma , edited by Pierre Lherminier, Paris, 1960.
" La Kermesse héroïque ," in Avant-Scène du Cinéma (Paris), no. 26, 1965. Jacques Feyder ou le Cinéma concret (anthology), Brussels, 1949. Bachy, Victor, Jacques Feyder , Paris, 1966. Ford, Charles, Jacques Feyder , Paris, 1973. Abel, R.D., French Cinema: The First Wave , Princeton, New Jersey, 1984. Chaperot, Georges, "Souvenirs sur Jacques Feyder," in Revue du Cinéma (Paris), 1 July 1930. Obituary in New York Times , 26 May 1948. "Feyder Issue" of L'Ecran Français (Paris), 8 June 1948. "Feyder Issue" of Ciné-Club (Paris), 2 November 1948. "Jacques Feyder" in Film Dope (London), September 1978. "Jacques Feyder," National Film Theatre Booklet (London), August 1983. "Dossier Jacques Feyder," in Cahiers de la Cinémathèque (Paris), no. 40, Summer 1984. Courtault, D., "Les Frenchies en Californie," in Cinémaction (France), no. 56, July 1990. Oms, M., "Dossier sur Le Roi Lepreux ," in Cahiers de la Cinémathèque (Paris), no. 57, 1992. Antoine, Raymond, and Charles Van Der Hagen, Jacques Feyder et son chef d'oeuvre , Belgium, 1974. Underneath everything Jacques Feyder did was a great love and mastery of his medium that gave integrity and style to his work. As a young man he rejected the bourgeois background of his Belgian home and became an actor. He fell in love with the talented Françoise Rosay, who became his partner for life. He acted in the cinema of Victorin Jasset, Feuillade, and Léon Gaumont, then became a scriptwriter, and finally began directing. Feyder's individual approach to La Faute d'orthographe did not commend itself to Gaumont, and Feyder raised the money to make the popular novel of Pierre Benois, L'Atlantide. This film, despite the presence of an ill-chosen Napierkowska in the lead, was an international success. The scenes shot in the Sahara under difficult conditions balanced the picturesque and exotic interiors, depicting an underground city. Dining out in Montmartre, Feyder and Françoise discovered a boy playing in the street. This child was little Jean Forest, whom Feyder directed with consummate skill in three films, Crainquebille, Visages d'enfants , and Gribiche. The first, based on the Anatole France story, added to Feyder's reputation, while the second, shot with simplicity and sensitivity in the Haut Valais, Switzerland, showed that Feyder possessed a remarkable skill for directing child actors. Gribiche was his first film for the Russian-inspired Albatros Company. It introduced the designer Lazare Meerson, working in the Art Deco style. It also featured Françoise Rosay in her first major role. Following a pictorially beautiful Carmen , with a recalcitrant Raquel Meller in the title role, came Feyder's masterpiece. Thérèse Raquin was shot in a German studio and featured Gina Manes in her greatest part. Zola's sombre bourgeois tragedy was brought vividly to life. The details of the Raquin home, the human tensions, the unspoken words, and the looming shadows created an unforgettable effect. At the end of the saga, the old, dumb, and paralysed woman peers through those shadows to watch the dead bodies of the murderous lovers lying on the floor. This scene remains one of the great moments of cinema. After an irreverent satire on French politics, Les Nouveaux Messieurs , which succeeded in getting itself banned, Feyder set out for Hollywood. He directed Garbo in The Kiss , her last silent film and one of her most intelligent roles. Feyder proceeded to tackle the sound film with European versions of Anna Christie, Le Spectre vert , and Olympia . In 1931 he directed Ramon Novarro in Son of India and Day Break before returning to France. Teaming up with his fellow countryman Charles Spaak he made in quick succession Le Grand Jeu , one of the best films of the Foreign Legion; Pension Mimosas , with Rosay in a great tragic role; and the delightful, decorative, and witty La Kermesse héroïque , a costume film that defies the ravages of time. The latter outraged the sensibilities of his fellow Belgians even as it delighted the rest of the world. 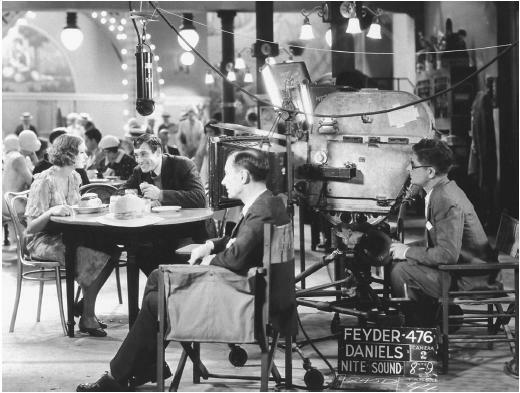 Feyder directed Knight without Armour for Alexander Korda in London, Dietrich playing opposite Robert Donat. This story of the revolution in Russia featured an elegant Dietrich moving through picturesque landscapes and great buildings designed by Lazare Meerson in one of his last assignments. Feyder then went to Germany to make Les Gens du voyage in two versions. After this story of circus life he returned to France and made his last important film, La Loi du nord , with Michele Morgan. This story of a Mounted Police search for a murderer in the Far North still showed the Feyder quality. Shortly after its completion, France was invaded. Feyder chose to live in Switzerland during the war. He turned out a star vehicle for Françoise Rosay, Une Femme disparait , in 1941. He died in Switzerland in 1948, a year which also saw the passing of Eisenstein and Griffith. Feyder was in the company of his peers. But in 1970 René Clair could still say "Jacques Feyder does not occupy today the place his work and his example should have earned him."